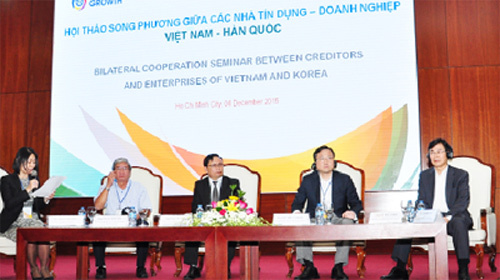 (VEN) - South Korean businesses spoke highly of Vietnam’s economic prospect at a bilateral workshop held recently in Ho Chi Minh City by the Ho Chi Minh Stock Exchange (HOSE) and hosting Vietnamese and Korean credit institutions and companies. A HOSE representative presented the South Korean investors listed at the HOSE. Since the first transaction session on July 28, 2007, when only five companies were listed with total market value of VND986 billion, the HOSE now services 309 companies with total market value of VND1,214,512 billion on November 5, 2015. To give South Korean investors an overview of the Vietnamese securities market, the State Securities Commission’s Market Development Department Director Nguyen Son spoke about the reality and targets for the Vietnamese securities market in terms of policies and directions for the market. 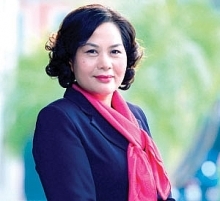 These include increasing share supply, stimulating capital flows by increasing the Vietnamese securities market’s rating on MSCI and increasing foreign investors’ ownership of public companies (the ownership rate has currently increased to 100 percent), accelerating the pace of market restructuring such as allowing foreign securities trading organizations to buy and hold from 51-100 percent of capital of securities companies, and developing support products and services such as a securities lending borrowing and lending system and reducing the securities payment duration. It is also necessary to build a new transaction mechanism which is applied worldwide, allowing investors that are eligible to both buy and sell securities, to sell future securities and to complete transactions within a day. At the workshop, representatives of the General Consulate of the Republic of Korea (RoK) and South Korean businesses spoke highly of Vietnam’s economic prospect and showed their desire to join and develop the Vietnamese capital market. The South Korean General Consulate’s Trade Counselor Kim Su Ho spoke about the Asian Development Bank’s statement that Vietnam’s gross domestic product has grown when compared with China, the RoK, Indonesia, Thailand, the Philippines and Malaysia. Vietnam’s inflation rate was pegged from 9.1 percent in 2011 to just 0.9 percent in 2015. The country is becoming an attractive destination for South Korean investors. For example, 34 South Korean companies in finance, securities, insurance and financial leasing have opened their representative offices, expanded ties and involved in Vietnam’s capital market. Economic relations between Vietnam and the Republic of Korea have developed robustly in recent years. More than 4,000 South Korean businesses are investing in Vietnam providing over 700,000 jobs and leading foreign countries and territories in terms of foreign direct investment (FDI) in the country with total investment of US$37.2 billion.